The Acura ILX invoice price and the true dealer cost are not the same. Note: The Acura ILX pricing report below does not include rebates or incentives. View Acura Rebates, Discounts and Deals. The 2019 Acura ILX is now here and looks better than expected. If you happen to have a knack for luxury cars that can still perform and meet a medium range budget, this is the vehicle for you. Despite it being one of the least luxury car models, the 2019 Acura ILX certainly has some features that are worthwhile. Some of the standard features include a steering wheel covered in leather and heated front seats. Whether you’re a big fan of the Acura or imply making an evaluation, the 2019 Acura ILX now has a few adjustments and improvements that you might want to know. The 2019 Acura ILX is out to bring what it does best – power driving. Indeed, this year’s Acura is seen to be a favorable upgrade from its predecessor, the 2018 Acura. The 2019 ILX is built with the features of AcuraWatch safety which is standard. The 2018 version may have had an in-built infotainment system, but the 2019 Acura ILX comes with an updated one that features a dual screen. This upgrade brings us to the new audio features that are included in the vehicle. These features being the Apple CarPlay and the Android Auto compatibilities. The vehicle is designed to look sleek and with a luxurious finishing thanks to the interior and exterior refreshment. The latest 2019 Acura ILX is a sedan that has improved handling that gives you a satisfying sensation when steering. Despite it being priced below the average luxury car price range, the vehicle still offers a number of features that will give you value for your money. The improved interior allows a maximum of five passengers and the leg-room at the back is confirmed to be just enough. There’s also a moon roof that’s sub-divided in-between the two rows that allows it to open and slide over a slope that allows it cut over the rear-headroom. As part of Acura’s standard, the vehicle still comes with heated leatherette-trimmed sports seats at the front, an adjustable driver’s seat (8-way adjustable seat), a shift-knob and a steering wheel wrapped and covered in leather. In addition, there’s an inclusion of an adjustable front passenger seat that can be done so in four ways and is trimmed in leather. The new Acura comes in only one trim and is priced at $25,900 which places it as one of the most affordable vehicles under the category of luxury cars. 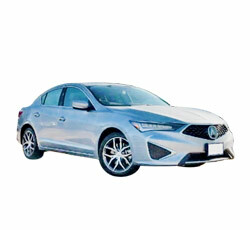 There are also extra packages that you can include and a fully loaded Acura would cost about $35,500 which quite fair owing to the fact that several luxury car competitors would price their vehicles far from that mark. Either way, the different optional packages should cost about $2,000 each and includes Premium, Technology, and A-Spec. Starting at $1,750, the Premium includes a power adjustable passenger seat (4-way), all seats are trimmed in leather, blind-spot monitoring backed up by traffic alert, an audio system that powers seven speakers, a touchscreen of 7 inches, an information display of 8 inches, and the inclusion of Apple CarPlay and Android Auto. The Technology Package requires an installation of the Premium and includes a navigation and AcuraLink telematics system, as well as a premium audio system with 10 speakers. The A-Spec is priced at $2000 and requires the Premium. It includes sporty adjustments such as larger wheels, a rear spoiler, and suede car seat inserts. The 2019 ILX has a 2.4-liter four-cylinder engine that has 201 hp. Despite the fact that the engine won’t amuse you with brute muscle, the power will definitely speed you past other cars in the city and on the highway. The handling is good enough which makes it very comfortable to steer around. The 2019 ILX was given a five-out-of-five overall rating by the National Highway Traffic Safety Administration. This makes it a safety-conscious vehicle that still meets performance. According to the luxury car class, the 2019 ILX has done considerably well. This is because it has a 24 mpg record in the city and a 34 mpg on the highway. This makes it stand out among several luxury cars that would typically consume a lot more both in the city and on the highway. The 2019 Acura ILX is a luxurious, comfortable and sporty car that can still perform and bring pleasure when on the road. This makes it one of the must-try cars in the 2019 list. Example: Base Acura ILX invoice price + the dealer Invoice price of options + destination - Holdback = Total Dealer Cost. Note: All Acura ILX MSRP, invoice and dealer cost dollar figures above are approximate amounts. Prices are subject to change without notice.